One of the first speakers I owned was Definitive Technology’s very first model, the BP10, a floorstanding bipolar design. I loved their big, rich sound, and they served me well for many years. Even when I outgrew them as my main speakers, I continued to use them as surrounds in my home-theater system, with excellent results. A lot has changed since then. Definitive now offers a full range of subwoofers and speakers, including lifestyle, in-wall, bipolar, and direct-radiating designs, including some with powered woofer sections. Their highly regarded Mythos SuperTower models are slim, elegant floorstanders with curved aluminum enclosures and powered woofers. Recently, Definitive has entirely upgraded their bipolar series with tweeters and midrange drivers based on those in the Mythos models, and with powered subwoofer sections with all-new digital amplifiers, drivers, and passive radiators. 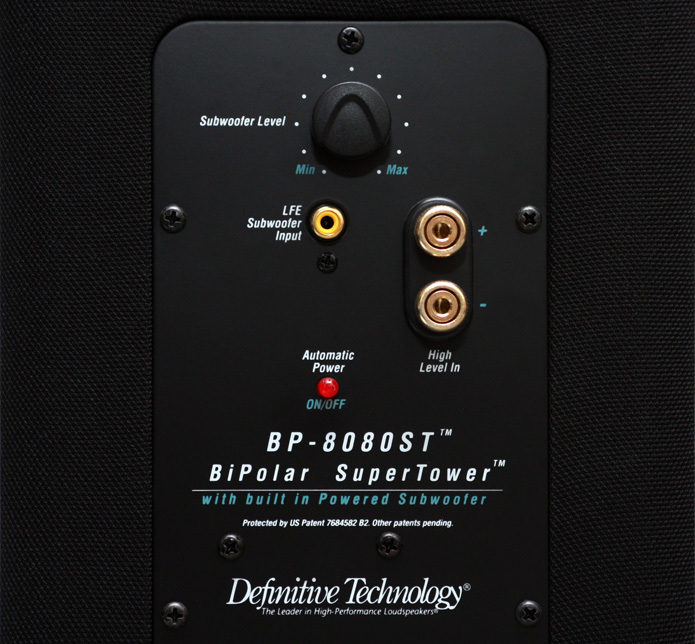 I received for review the top model of their new bipolar (BP) line, the BP-8080ST SuperTower ($2998 USD per pair). The BP-8080ST is narrow, deep, and tall, measuring 48.25”H x 7”W x 16.3”D and weighing 66 pounds. Its combination of slimness and height requires outrigger stabilizers (included) to keep it steady; these can be fitted with floor glides or spikes. Like previous Definitive bipolar speakers, the BP-8080ST is encased in a black cloth “sock” -- all but the top and bottom, which have glossy plastic endcaps. The speaker is attractively slender, and the sock gives it a smooth, edgeless appearance, but there’s more to the BP-8080ST than a handsome face. A lot of technology is packed into it, especially considering its relatively modest price. Each BP-8080ST has six drivers and two passive radiators. Behind the sock on the narrow front surface are a 1” tweeter and two 5.25” midrange drivers, and on the rear are an identical midrange and tweeter. On each side is a 12.5” passive bass radiator, and above this, on the left side only -- the two speakers are not “mirrored” -- is a 12” subwoofer cone. 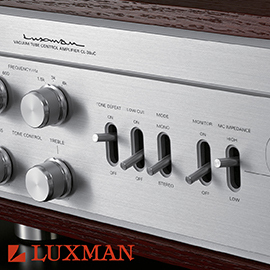 This is driven by a 455W class-D amplifier and controlled by a digital signal processor that provides a phase-coherent crossover to the midrange, and equalization to smooth the frequency response. The midranges are the second generation of Definitive’s Balanced Double Surround System (BDSS) drivers, whose cones are supported by surrounds at both the inner and outer edges for longer, more linear excursion. 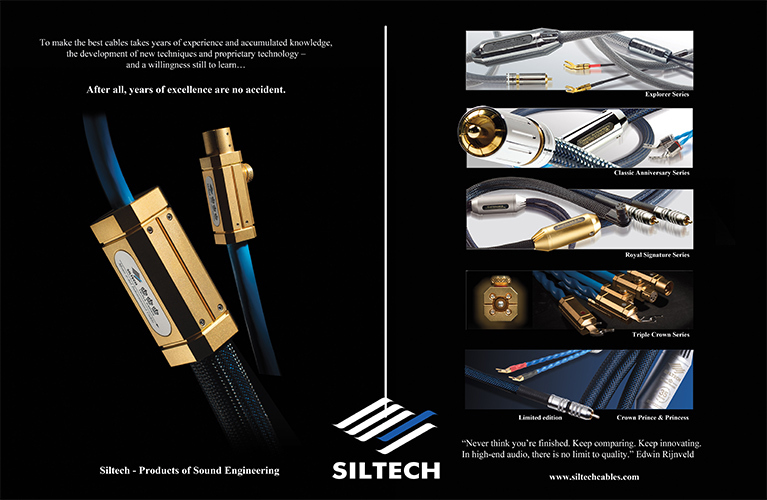 Their Linear Response Waveguides are flared phase plugs that Definitive says are invisible to lower frequencies, but that prevent shorter-wavelength higher frequencies from interfering with each other, to provide smoother high-frequency response both on and off axis. 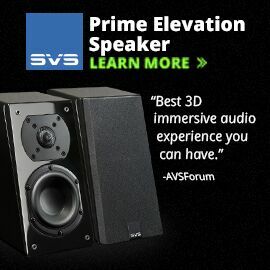 The tweeters are very similar to those found in Definitive’s excellent-sounding Mythos SuperTower speakers. 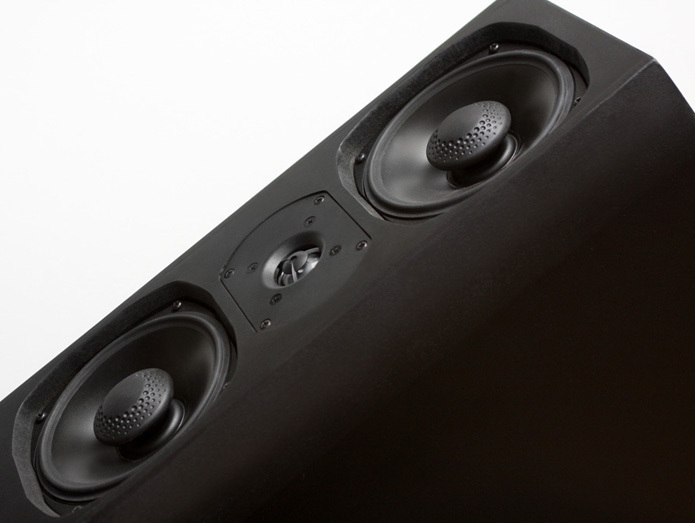 The front and rear driver arrays are each sealed in their own subenclosures, to isolate them from the subwoofer. This serves to prevent the sub’s back pressure from affecting the movement of the midrange drivers, and the subenclosure’s added bracing acts to increase the BP-8080ST’s overall rigidity -- as does the addition of an extra layer of MDF wherever a driver or bass radiator is attached to the walls of the enclosure. 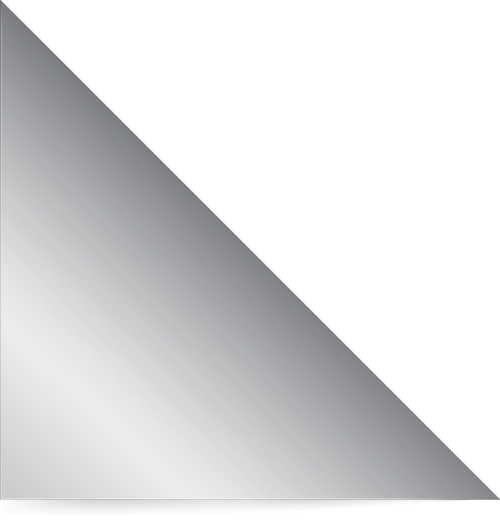 The lack of grilles and beveled edges reduces diffraction from the cabinet. 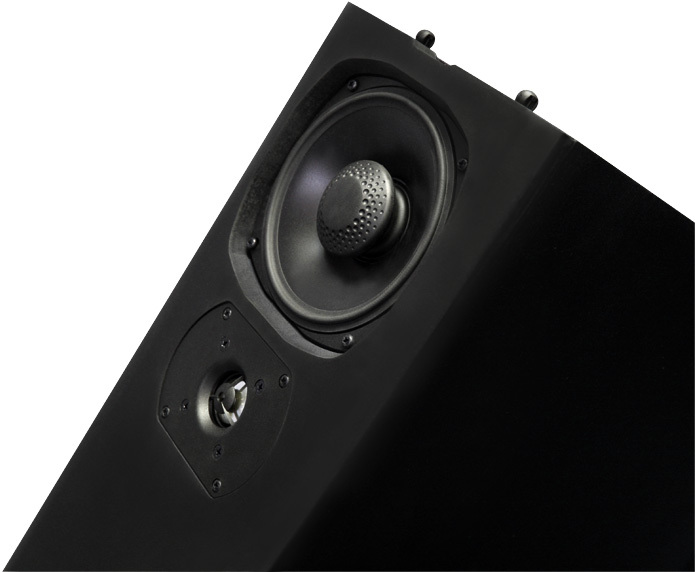 The BP-8080ST is a bipolar speaker, which means that the front and rear driver arrays work in phase; however, the rear array’s output is about 6dB lower than the front array’s. Definitive calls this their Forward-Focused Bipolar Array Technology. They claim that reducing the rear output improves the localization of sounds within the soundstage while retaining much of the spaciousness and sense of envelopment associated with bipolar speakers. The dispersion patterns of Mirage’s latest generation of Omnipolar speakers, including their top-of-the-line OMD speakers, which Doug Schneider and I have reviewed very favorably, are also biased toward the front of the speaker. Around back is an inlet for the removable IEC power cord (provided) for the subwoofer amp, as well as an optional line-level RCA input, a level control, and an LED power indicator. About the only things I didn’t like about the BP-8080ST were its binding posts, which are vertically arrayed and very close together, about a foot up from the bottom of the speaker. This made it somewhat difficult to use heavy speaker cables with large spades; they hung awkwardly to one side of the speaker and fairly high off the floor. Other than that, I found much to admire in the BP-8080ST. 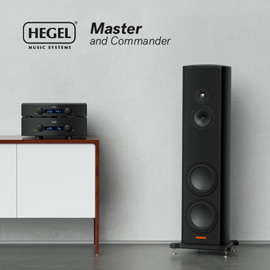 In fact, few if any of its competitors offer bipolar design, technologically advanced drivers, and a built-in powered subwoofer at anywhere near the price. Although the BP-8080ST’s bipolar dispersion pattern means that its output will interact with room boundaries more than most speakers, I didn’t find them particularly difficult to place. They sounded very good in the usual speaker positions in my listening room: a couple of feet out from the front wall and a few feet from the sidewalls. I toed them in toward the listening position and fiddled with their placement slightly to maximize their imaging. I didn’t use the BP-8080STs’ subwoofer connections, instead relying on the speaker-level connections and the speaker’s internal crossover. I used an SPL meter and a test CD with low-frequency test tones to set the subwoofer level. But the bass sounded a little too loud, so I turned down the subwoofer level slightly. Now the BP-8080STs sounded a bit tighter and clearer. The BP-8080STs were connected to a Bel Canto Design e.One C5i integrated amplifier/DAC with Analysis Plus Black Oval 9 speaker cables. The source component was an Acer Aspire One 722 laptop computer running foobar2000 via an AudioQuest Carbon USB cable. Also in the system were ESP MusicCord-Pro ES power cords, and a Blue Circle Audio Peed Al Sea Thingee power conditioner and ZeroSurge 1MOD15WI for surge suppression. Yes, the BP-8080ST is a bipolar speaker with a certain spaciousness to its sound, but its dominant sonic characteristic, and the first thing I noticed, was its neutrality. Everything from voices to acoustic instruments and percussion sounded ultraclean and natural. Imaging was precise -- the soundstage was well delineated while still being very wide and deep. The speaker was able to unravel complicated musical passages without sacrificing the ability to play at extremely high output levels. The heartbeat-like bass notes of “Fallen Angel,” from the remastering of Robbie Robertson’s Robbie Robertson/Storyville (Expanded Edition) (16/44.1 FLAC, Universal), was spectacularly articulated, with a pulsating, organic quality unlike anything I’ve heard from a speaker at this price. It wasn’t so much the quantity of the bass as its responsiveness that gave it an incredibly fast quality. The less visceral but more cerebral “Somewhere Down the Crazy River” was a lush symphony of Robertson’s precise, raspy voice, ethereal choruses, and captivating rhythms emanating from a deep, cavernous soundstage. The BP-8080ST’s bass was precise and controlled, but, as expected from a speaker with a 12” driver, two 12.5” passive radiators, and a 455W amplifier, it could truly pound. Daft Punk’s “Solar Sailor,” from the Tron: Legacy soundtrack (16/44.1 FLAC, Walt Disney), sent wave after wave of deep, rolling low frequencies through my listening room. The sustained, subterranean bass notes were all around me but didn’t blend together, providing an enveloping but well-defined presence. When I cranked up “Seven Drums,” from Dadawa’s Voices from the Sky (16/44.1 FLAC, Warner), the Definitives could play louder than I could stand while remaining absolutely coherent. The bass was again taut and filled the room, hitting me squarely in the chest with a concussive quality -- but at the same time, Dadawa’s soaring voice remained stunningly clear. The BP-8080ST was equally capable when a more delicate musical touch was required. Leonard Cohen’s latest, Old Ideas (16/44.1 FLAC, Columbia), is a fantastic album filled with simple arrangements highlighting his gravelly voice, which is sparingly contrasted with and beautifully framed by female harmonies. “Show Me a Place” is one of the most beautiful and uplifting songs I’ve heard in a long time. Cohen’s close-miked voice was placed slightly forward in the soundstage, with a delicate but low rumbling quality. Reading one of Doug Schneider’s recent equipment reviews, I was reminded of “Pacing the Cage,” from Bruce Cockburn’s The Charity of Night (16/44.1 FLAC, True North), which I hadn’t heard in a while. I cued it up. I don’t think Cockburn gets enough credit for his accomplished guitar playing, and his captivating, laid-back style is on display in this track. The BP-8080STs perfectly captured the timing and ease of his playing with excellent truth of timbre. His voice was solidly placed between the speakers in three-dimensional space, with clearly defined outlines and a rich palpability that was not only remarkably realistic but very full-bodied and pleasing. The BP-8080STs projected a bigger soundstage than have most speakers in my room, but I didn’t find it distracting or artificial sounding. Voices and instruments were not recessed but placed perfectly on the stage. The piano in the cover of Paul Simon’s “Boy in the Bubble” on Peter Gabriel’s Scratch My Back (24/48 FLAC, Society of Sound) filled the entire soundstage, while Gabriel’s voice was just slightly behind the plane of the speakers, exactly as it should be. The BP-8080ST sounded quite accurate, as stated, but also very “musical” and satisfying to listen to. Add to this the facts that it could play incredibly loudly without distortion, and can even be used in a home-theater system without a standalone subwoofer, without the user having to give up much in the way of bass. The combination of Bel Canto e.One C5i integrated amplifier/DAC ($1895) and Definitive Technology BP-8080STs ($2998/pair) comprised a true high-end audio system at a reasonable price. The BP-8080ST’s active subwoofer section allowed it to play at incredibly high volume levels, even though the Bel Canto is specified to put out only 60Wpc into 8 ohms or 120Wpc into 4 ohms. Definitive’s own Mythos STS (also $2998/pair) also has a powered subwoofer section, but the BP-8080ST’s bass was definitely deeper, louder, and better controlled. Higher in the audioband, the differences were more difficult to judge. I recall the Mythos STS as also having a very neutral and accurate midrange that served voices especially well, and a smooth, extended treble. In that regard, I’d say that the BP-8080ST sounded at least as good as the Mythos STS. The BP-8080ST was indeed very neutral and smooth in the midrange and highs, but didn’t have the sweet, sparkling quality of the PSB Imagine Mini ($760/pair), which sets the standard for speakers in its price range. Not many speakers at anywhere near its price can match the Imagine Mini’s silky-smooth midrange and sparkling highs, but the BP-8080ST came close -- and its ability to play much louder and deeper made it a far more satisfying speaker to listen to with most music. When I listened to “Western Wall,” from The Very Best of Rosanne Cash (16/44.1 FLAC, Columbia), the acoustic guitar was reproduced exquisitely by the BP-8080ST, as was Cash’s voice, which was finely detailed with excellent dimensionality -- all characteristics of a true high-end loudspeaker. At the same time, the BP-8080ST was able to solidly reproduce the subtle but very deep foot stomps 25 seconds into this track better than any speaker I have ever had in my system. 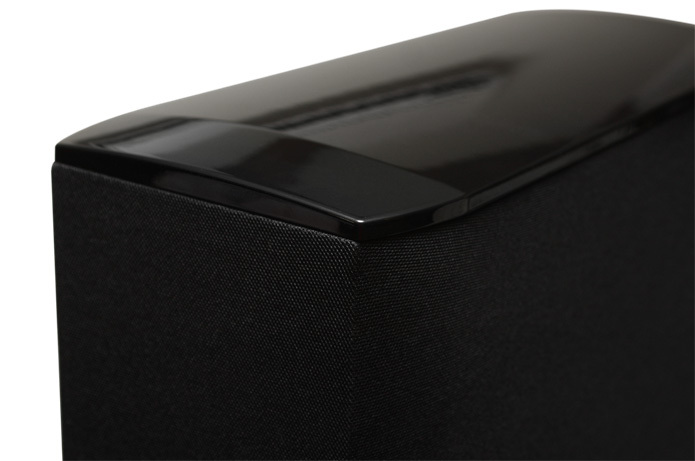 Many speakers can only hint at these stomps, and require the aid of a very good subwoofer. When I reviewed the Definitive Technology Mythos STS SuperTower loudspeaker, I was impressed by how good it sounded, especially considering its slim, good looks. I was even more impressed by the excellent performance of Definitive’s new BP-8080ST SuperTower. By any standard, both are exceptional speakers. Those who might dismiss the Mythos STS because of its “lifestyle” look will miss out on a great speaker. Those who might dismiss the BP-8080ST because of its bipolar design or other reasons will miss out on an even better one. Price: $2998 USD per pair. Warranty: Five years parts and labor; three years, amplifier electronics.